Trial: Feature-limited (saves up to 50 MB). Whenever my hard drive space is low, the usual candidates for removal are iTunes duplicate songs, copies of movies or pictures I made, expired demos, and items in the download folder. The Applications folder takes up about 10% of the entire hard drive, but other than throwing away any demos or software that are no longer useful, there is not much else I can do about that folder. Or is there? With my recent discovery of Xslimmer, there is one more way to reclaim some hard drive space. There are two potential sources of hard drive space that can be reclaimed with Xslimmer: Universal applications and localization files. In 2006, after many years of using the PowerPC processor, Apple made the switch to Intel. Existing software made for the PowerPC chip still worked through the Mac OS X dynamic translator, Rosetta. However, if developers wanted to take advantages of the Intel processor they would have to adapt their applications for the new architecture. Not to ignore the installed user base with PowerPC Macs, developers also maintain their code to work with the PowerPC processor. Instead of offering different versions of the same programs, many Mac programmers include code for both architectures in their software. Universal applications run natively on both PPC and Intel Macs. While it is convenient for the users not to need to know which version, PPC or Intel, of a program to install, a small price to pay is that Universal applications take up more hard drive space. Today’s Macs boast hard drives of 160 GB or more, and it may not matter if a few gigs are lost to software written for a processor that’s not present in the machine. For older Macs with smaller hard drives, Xslimmer provides a safe and simple way to reclaim the lost space by removing the extraneous Intel machine code (on PPC Macs) or PPC machine code (on Intel Macs). Another way Xslimmer reclaims hard drive space is by removing language files. Many programs boast about their localization feature, meaning the applications’ interface can be displayed in the language chosen. While localization is a good selling point for the developers, to most users it is just more wasted space. For example, even though I can converse in English, Vietnamese, and the Chinese dialect Cantonese, English is the only language I can compute in. If I have to work with menus and dialog boxes in any other languages, my computing experience would be very unpleasant. 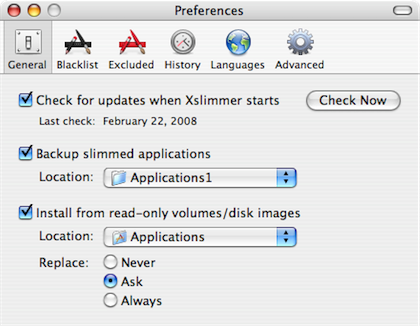 Upon opening, Xslimmer invites you to drag applications into its window. Drag in an application, look at the Sizes column to see how much space you will save, and click the Slim! button. Presto, the application now takes up less space because it has only the code pertinent to your machine’s processor. 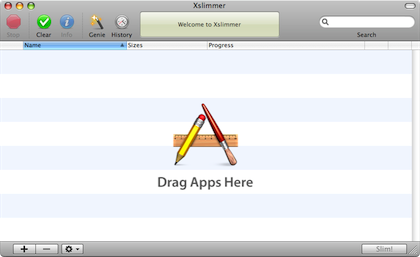 Drag an application into the Xslimmer window. Alternatively, use the Genie button to scan your hard drive for eligible applications. Click on the Info button to read more about the highlighted application, then click the Slim! button in that window to slim just that one application. If you are comfortable about it, slim everything in one fell swoop by clicking the Slim! button in the main window. Let the Genie find the eligible applications for you. Actually, before you even slim a single application, it is wise to visit Xslimmer’s Preferences window. The first setting you should change is Backup. Using Xslimmer is supposed to be safe, but it cannot hurt to back up your applications should anything go wrong. It does not make sense to back up to the hard drive where you are trying to save space, so I recommend an additional hard drive. To restore an application, you would have to go through Xslimmer, as the backup of the application is not normal application that you can double-click to launch. Have a backup plan before you start slimming. Backing up of applications is not Xslimmer’s only safety net. Xslimmer works with a blacklist of applications, and you can also maintain your own excluded list. I do not believe in feng shui and already used Xslimmer on many applications, but I still feel uncomfortable about having it touch iTunes. I really like my playlists, podcast subscriptions, even the sync settings, and do not want to take any chances with losing them. It is an irrational fear, as those files are not in the iTunes executable file. Still, I added iTunes to the excluded list, and even if someday I become forgetful and try to slim iTunes, Xslimmer will refuse to work with it. Last but not least, starting with version 1.2.8, Xslimmer honors the code signing technology introduced in Leopard. Xslimmer will not slim resources that the developer has marked as mandatory. To many people, using Xslimmer to reclaim some hard drive space may not worth the trouble. How much space can you reclaim? In my case, with a PowerBook and an 80 GB hard drive, I was able to save more than 800 MB (over 1.1%), as shown by the History window of Xslimmer. I believe the effort is worthwhile. Xslimmer by itself certainly cannot free up the space I need, say a few gigs to put the amount of free space over 4.3 GB so that a DVD can be copied. It must be used along with other applications or processes. If I did not reclaim that 800 MB via Xslimmer, I would have to work harder with other processes. Maybe I would have to search through iTunes for more songs or podcasts I no longer want, or use Baseline to find more big files to delete or compress. 800 MB saved on my 80 GB PowerBook. So far I haven’t had any troubles with the slimmed applications. For applications that I use regularly, once they are slimmed I launch them to make sure that they still work. In many forums that discuss Xslimmer, a common complaint is that there are free applications that can do Xslimmer’s job. While it is true that there are applications out there perform similar tasks, i.e. removing unneeded code or languages, none exactly match Xslimmer’s feature set. First there is the lipo Terminal command. The issue with Terminal commands is that you have to know exactly what to type. The other “competitors” to Xslimmer may have a graphical interface, but some only work on PowerPC Macs, and others do not have a backup and restore mechanism or a history page. One Xslimmer feature I really like is the ability to install and slim applications from disk images. You drag an application from the disk image onto Xslimmer, and it copies it to your Applications folder and slims it in one step. As most of my new applications nowadays are downloaded instead of bought on a CD, having this feature helps greatly, especially with applications that are updated regularly. I have only a few minor issues with Xslimmer. I think there should be a way to selectively slim a few applications together. Currently, you either slim one application with the Info side window’s Slim! button, or all the applications using the main window’s Slim! button. What’s more, the main window’s Slim! button should prompt for confirmation. I think it is safer to slim a few applications at a time and test them as you progress. 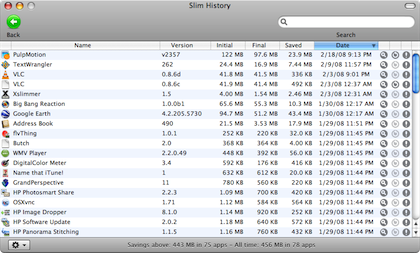 If you have a large hard drive, Xslimmer may not be the application for you. However, for older Macs with small hard drives, it is a great tool to have when used with other space-saving applications or processes. Judging by my own experience, and according to the forums on the Web, Xslimmer works safely and reliably. There are many ways to ensure that slimming the applications does not cause problems, such as backups and the blacklist. There are free alternatives, but in Xslimmer’s case, you get a lot more for your $12. Xslimmer is a Very Nice application to have in every space reclamation endeavor. Copyright © 2008 Linus Ly, lly@atpm.com. Reviewing in ATPM is open to anyone. If you’re interested, write to us at reviews@atpm.com. Monolingual, an open source program, does this as well, and has for quite some time - for free. However, it doesn't offer the backup option or have a programs blacklist, so I only use it for removing unnecessary languages and input managers. Thank you for your informative review on Xslimmer. I saved closed to 5 GB of space when I was done. However, watch out for Adobe programs: I did strip the extra languages out from Adobe Acrobat Pro v.7. It disabled the application! The most unpleasant part of it was not the CD re-install, but to get Adobe tech support to simply confirm the correct upgrading sequence to 7.x available from their website afterwards. Xslimmer is a great application indeed. And absolutely designate an external hard drive for the "back-up". I learned the hard way and had to delete dozens of back-ups by hand!. . .